In this exercise, you will perform geometry optimization using DFT. In the previous exercises we initially specified all parameters – pseudopotential and basis set coefficients as well as atom coordinates – in the input file. Later we used the pseudpotentials and basis sets from a file provided by CP2K. Now we go further and also factor out the atomic structure to make it easier to automate different calculations for the same structure or the same calculation for different structures. The format used for this is the same you will get for trajectories from MD for example. &SCF                        ! Parameters controlling the convergence of the scf. This section should not be changed. Note the different RUN_TYPE and the changed PROJECT name. The latter is not strictly necessary but recommended, since CP2K automatically creates additional files using this project name as a prefix. For each convergence criterion you see the value which is used to check whether convergence is reached and convergence is only reached if all of them are satisfied simultaneously. Now change the used coordinate file to ethane2.xyz and update the PROJECT name to not overwrite the results from the previous simulation and run it again. Open the two output XYZ files (<PROJECT>-pos-1.xyz) in VMD and compare them. Is there a difference? What is it? Which one is likely to be more stable and why? 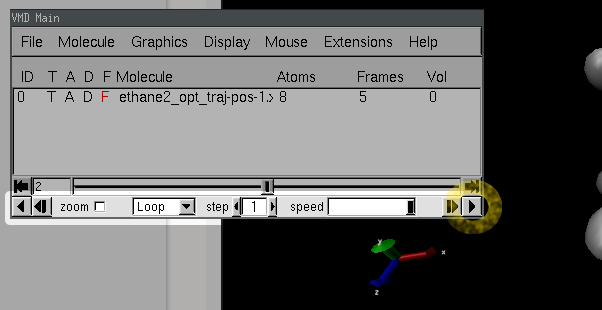 Append the following section to your input file (does not matter for which structure) and run the simulation (it does not matter which one) again.